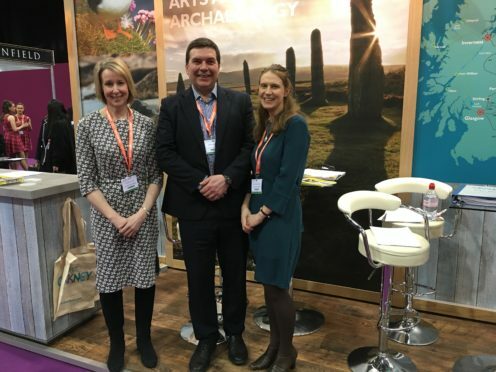 Destination Orkney were among those at the VisitScotland Expo in Glasgow, where almost every appointment offered by the island tourism initiative was snapped up. The event is regarded as Scotland’s flagship event for travel trade and attracts representatives from all sectors of the international tourism industry. Elaine Tulloch, chief executive of Destination Orkney, said: “Interest in Orkney this year was unsurpassed. “Operators are looking for something different for their individual clients to experience. “We supplied the operators with all the information they need to include Orkney in their touring programme. “Our travel trade Tool-Kit includes Orkney itineraries, contacts of Destination Orkney members and images. “It makes it easy for operators to offer Orkney to their individual guests, couples and families. The Destination Orkney partnership aims to responsibly boost tourism in the islands over the course of seven years and was forged to take control of tourism on the island from the Area Tourism Partnership.